The best coaches in any sport are the ones who adapt to their athletes and make them better. 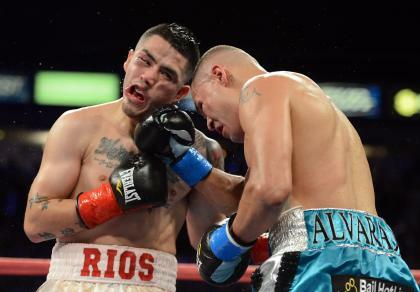 In boxing, no one did that better in 2012 than Robert Garcia, the Yahoo! Sports Trainer of the Year. Garcia trains a slew of fighters, but his three top pupils are Nonito Donaire, Brandon Rios and his younger brother, Mikey Garcia. Combined, they were 8-0 with five knockouts, but seemed to get better each time out. Donaire and Rios are world champions on the verge of big-money fights, while Mikey Garcia will fight for his first world title on Jan. 19 when he challenges Orlando Salido in New York. Robert Garcia's ability to make sure his fighters are always in shape, are using the style that is best suited for their talents and to adjust during fights sets him apart from most other trainers. He's on the verge of joining the class of trainers such as Eddie Futch, Ray Arcel, Emanuel Steward, Angelo Dundee and Freddie Roach &ndash; men who have succeeded with various fighters and differing styles over a long period of time. Garcia is a relative newcomer to training and needs only time and continued success in order to be put on that pedestal. Nobody made his fighters better or had a better year among trainers in 2012 than Robert Garcia. KNOCKOUT OF THE YEAR – Juan Manuel Marquez made a lot of noise about the judges prior to his fight with Manny Pacquiao on Dec. 8. It turns out he didn't need to do so. Marquez landed a crushing right hand that knocked "Pacman" out cold as he fell face first on the mat at the MGM Grand Garden in Las Vegas. Nothing else was close. PROSPECT OF THE YEAR – Picking a winner in this category depends upon the criteria. In this case, I'm limiting my choices to fighters under 25 years old who have never fought for either the IBF, WBA, WBC or WBO world title and who have the most star potential. In that case, my choice is easy: Gary Russell Jr. He was 2-0 in 2012 to improve his record to 21-0. I'd like to see him more active and against better opposition, because he's been matched ridiculously easily. That said, he's got great tools and is the non-champion who is most likely to makes waves in the sport in 2013 and beyond. ROUND OF THE YEAR – You could take any round from the Brandon Rios-Mike Alvarado fight on Oct. 13 and it would deserve Round of the Year consideration. But the fifth round of that fight was truly a brutal and breathtaking round, as each man delivered untold punishment to the other. EVENT(S) OF THE YEAR – Sept. 15 in Las Vegas was the epitome of what boxing could be. There were two major events in town that night and each was sold out. The atmosphere at the MGM Grand Garden for Canelo Alvarez-Josesito Lopez was fantastic, perhaps topped only by that at the Thomas & Mack Center for Sergio Martinez-Julio Cesar Chavez Jr. It was a special night for the sport. MISTAKE OF THE YEAR/CENTURY/MILLENNIUM – Congratulations to Floyd Mayweather Jr. and Manny Pacquiao for locking this up for life. They not only blew the biggest payday in sports history, they blew a chance to define their legacies. They may yet fight, though I doubt it. Still, it will never, ever be the same. When this fight was first contemplated in 2009, it was between the two guys who were not only the two best welterweights in the world, but the two best fighters in the world. I always favored Mayweather and thought he would win, but there was an argument to be made before. Not anymore. No matter who you blame, they're both fools for not having insisted the match be made.